Northern Invasion Band Lineup Announced! 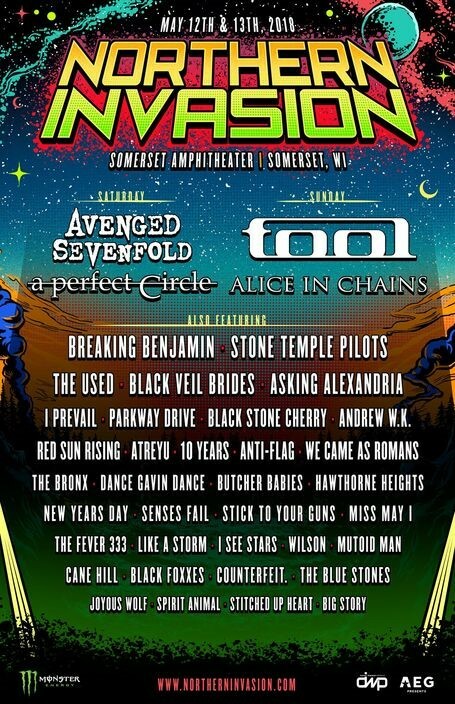 Tool, Avenged Sevenfold, A Perfect Circle and Alice In Chains lead the incredible lineup for the fourth annual Northern Invasion, Saturday, May 12 and Sunday, May 13 at Somerset Amphitheater in Somerset, Wisconsin, just outside the Twin Cities. Northern Invasion 2018 will be bigger and better than ever with over 12 hours of music per day from the biggest and best rock bands on three stages, as well as a top-tier camping experience. The Northern Invasion Good Eats area includes food offerings from top regional and national restaurants and vendors. The music lineup for Northern Invasion 2018 is as follows (subject to change): Tool, Avenged Sevenfold, A Perfect Circle, Alice In Chains, Breaking Benjamin, Stone Temple Pilots, The Used, Black Veil Brides, Asking Alexandria, I Prevail, Parkway Drive, Black Stone Cherry, Red Sun Rising, Andrew W.K., Atreyu, Anti-Flag, 10 Years, We Came As Romans, The Bronx, Dance Gavin Dance, Butcher Babies, Hawthorne Heights, New Years Day, Senses Fail, Stick To Your Guns, Miss May I, Like A Storm, The Fever 333, I See Stars, Wilson, Mutoid Man, Cane Hill, Black Foxxes, Counterfeit., The Blue Stones, Joyous Wolf, Spirit Animal, Stitched Up Heart, and Big Story. Northern Invasion General Admission and VIP tickets (including layaway options), as well as Hotel Packages and All-Inclusive Camping options, and Tent or RV Camping add-ons are on sale now at http://northerninvasion.com/tickets.html. Fans are encouraged to buy early and save. New for Northern Invasion 2018: Each ticket price level has a limited number of tickets available, so attendees can save more by buying earlier. Ticket prices will automatically move to the next price level once a price allotment sells out. The layaway purchase option also allows fans to split the ticket cost into four monthly payments. Specially priced tickets for Northern Invasion will be available for active military through partner GovX (www.govx.com) while supplies last. Northern Invasion is produced by AEG Presents and Danny Wimmer Presents and is part of the World’s Loudest Month concert series, which features the biggest names in rock music performing in six U.S. events in distinct atmospheres during five consecutive weekends in April and May of 2018. Northern Invasion is brought to you in part by Monster Energy.